Safety enhanced interlock switch leaves both hands conveniently in control. Non-conductive dual triggers eliminate shock potential. Fully adjustable handle positions. Balanced chassis design gives more precise pad pressure. All-metal chassis offers added weight for a faster, brighter shine. Separate non-marking transport wheels prevent cross-contamination. 1.5 hp, DC rectified motor eliminates brownouts, low voltage problems and start-up torque problems. Includes 50-ft. power cable. Motor plugs into power cable at handle base for easy, safe maintenance. Low-profile apron easily reaches under counters and covers. Non-marring full-wrap bumpers protect walls and baseboards. 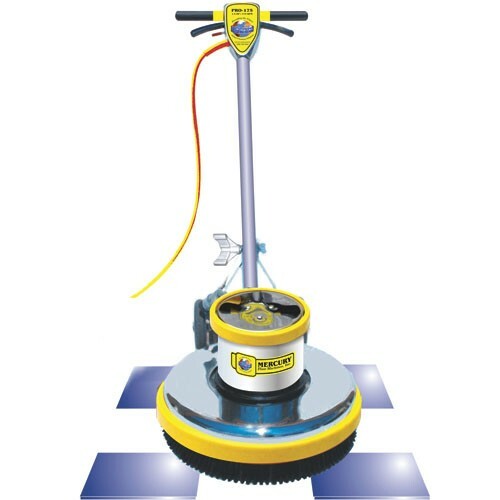 Flexible padholder with threaded pad-centering device conforms to floor irregularities, delivering an even shine and gloss. UL Listed. Accepts 20-in. synthetic pads. Manufacturer's five-year warranty motor and transmission.